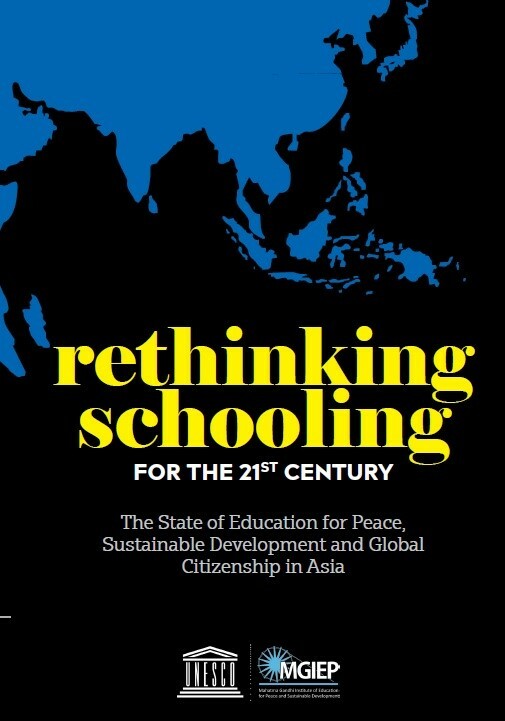 The UNESCO Mahatma Gandhi Institute of Education for Peace and Sustainable Development (MGIEP) publication “Rethinking Schooling for the 21st Century: The State of Education for Peace, Sustainable Development and Global Citizenship in Asia” argues that fundamental purposes of schooling need to be configured, if the ideals of education for sustainable development, global citizenship education and peace (SDG 4.7) are to be realized. It also seeks to develop benchmarks against which future progress can be assessed. This report involved more than 60 researchers from 22 countries in Asia and is based on the content analysis of key education policy and curricular documents from these countries and an extensive review of literature on Asian schooling. Under Chapter 6 of the publication, one will find analyses of different sub-regions in Asia, including Central Asia, and the challenges confronting efforts to reorient education towards peace, sustainable development and global citizenship. First, it exposes how schooling in post-Soviet Central Asia has been reconceptualised to serve the need for rapid nation building in a region whose states were unprepared for independence when the USSR collapsed. Second, the chapter highlights the transformation of Soviet-era understandings of education as a ‘common good’, and their supplanting, at least at the level of policy discourse, with a relentless emphasis on schooling as an instrument for generating ‘human resources’ equipped with the competencies the market demands. The global community committed to achieve Sustainable Development Goals (SDGs), including SDG4 on education by 2030. The target SDG4.7 is aimed at providing learners with the knowledge and competencies they need to make all of the SDGs a reality. Its focus is on cognitive, socio-emotional and behavioural learning outcomes that help learners in dealing with the particular challenges addressed by the SDGs. As United Nations Member States work towards achieving SDGs, they are called upon to rethink education to contribute to the SDGs. SDG4.7 provides a needed framework in this regard. For more information please read the full report here . Published in 2017 by the Mahatma Gandhi Institute of Education for Peace and Sustainable Development, 35 Ferozshah Road, New Delhi 110001, India, 326 pages.